On May 1, 1886, 80,000 workers marched down Michigan Avenue in Chicago in support of the eight-hour day. In the next few days, nationwide, 350,000 workers (including 70,000 in Chicago) went on strike at 1,200 factories. Since that time, May Day, or International Workers’ Day, has become a day of working class solidarity and struggle all over the world. On May 1, 2017, Chicago teachers, parents, students, and other workers will continue to fight against the rich and powerful. Our rallying cry is: stop the destruction of our schools and end the attacks on our students and families. Today, as in 1886, the wealthiest 10% have 75% of the U.S. wealth and close to 15% of people live below the poverty line. Today, as in 1886, immigrants are labeled criminals and blamed for economic woes caused by wealthy corporations. Workers, past and present, see May Day as an opportunity to protest the anti-immigrant policies of the federal government and call out racism as a weapon used to divide the working class. May Day is our day, the workers’ day! Nothing changes without a fight! On May 4, 1886, activists rallied in Chicago’s Haymarket Square at Randolph and DesPlaines to advocate for the eight-hour day and protest the police killing of several striking workers the previous day. Someone (most likely a provocateur) threw a bomb at the police as they were attempting to disperse the crowd. Seven police and four protesters were killed and others were wounded from the bomb and ensuing gunfire. The state charged eight activist socialists and union leaders (five of whom were immigrants) with murder. They were convicted and four were hanged. They were put to death not because they threw bombs or fired weapons on May 4, but because they were leaders of the eight-hour day movement. Nothing changes without a fight! Fighting back does not always result in immediate gains, but not fighting guarantees the continuing worsening of conditions. It took 70 years of struggle for the eight-hour day to become the law of the land. Along the way, some groups of workers won the eight-hour day, but others went on strike for weeks or months and in the end, went back to work with pay cuts. There was not a straight line of gains for the working class then, and there won’t be now. 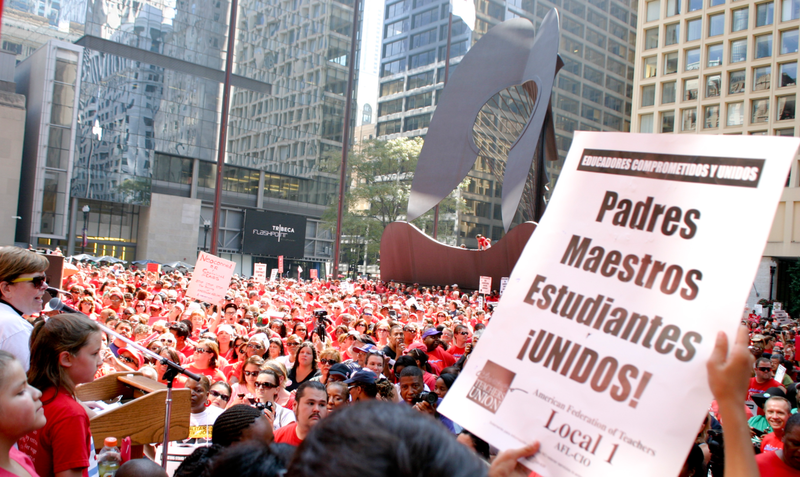 CTU members fight for the schools our students deserve, including actions on May 1, are part of the historical movement for workers’ rights. As the rich get richer and the conditions in schools worsen, a united, militant movement continues to grow. budget, Labor organizing, May Day. Bookmark.